Yep, this page is a little bit special because you get to edit it. I trust you'll only write nice things. Unrelated to this, I also disabled the save option. As soon as you've clicked the pencil icon the page will be editable and two new elements will appear; the toolbox and the inspector bar. The toolbox by default will appear in the upper left corner of the page, but it can be dragged to wherever you like. The inspector bar will appear fixed to the bottom of the page (it will be empty until an element on the page is selected). How do you know what content on the page you can edit? I admit it's not so hard to guess in this case, but imagine if you will a far more elaborate page design. Press and hold the shift key and after a few seconds a pulsing border will appear around the regions of the page that can be edited. To start editing, just click on any item of content within an editable region. Other than typing, there are two ways to add new content to the page; pressing the return key while editing a section of text (except pre-formatted text) or using one of the tools in the toolbox, for example to insert an image, video, table, etc. Some tools can also convert content, for example selecting a paragraph of text and clicking the list tool will convert the paragraph to a new list. Pre-formatted blocks of text can be converted back to standard text using the paragraph tool, however if you have a pre-formatted section of text and want to add a new paragraph after it you can hold down the ctrl key (command on Apple) whilst clicking the paragraph tool to achieve this. Each block of content on the page can be dragged to a new location. Non-text based elements such as images and videos can be dragged by clicking in the center of the element and dragging. For text elements you need to click and hold. This pause is implemented to allow you to freely select sections of text using the mouse without triggering the drag behaviour. If you want to drag a list or table then click and hold a child item or row. Continue to hold until the helper title changes to list or table. When you drag an element over another, arrows will appear indicating where your content will be placed once you release it. All elements can be placed above or below others, while some elements such as images and videos can be placed to the left or right of other content. 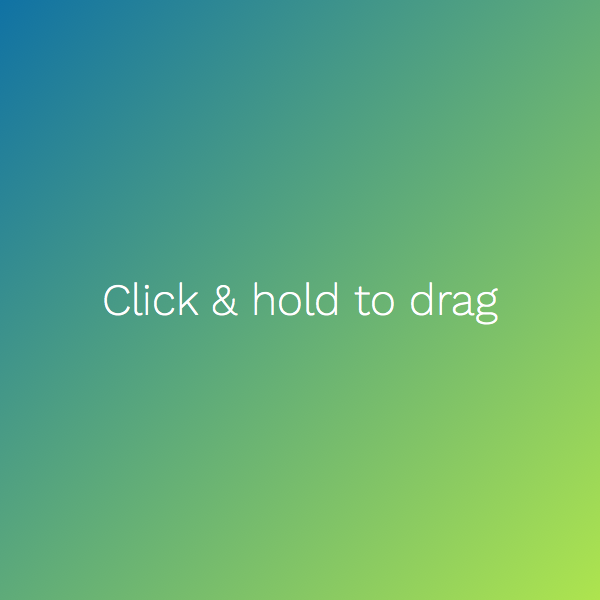 To resize an image or video, click and hold in any corner then drag to adjust the size as required. While you're resizing, the dimensions will be displayed in the top right hand corner of the element. Some elements are automatically removed when they become empty of content, for example text elements and list items will remove themselves when empty, as soon as they lose focus. Other elements like images and videos can be deleted using the delete tool in the toolbox or by pressing the delete key. By default the delete tool will remove an item in a list or a row in a table, but if you hold down the ctrl key (command on Apple) when clicking the tool, the entire list or table will be removed. The editor provides an interface for images to be uploaded, rotated and cropped before being inserted into the page. For the demo page all this functionality is faked as we haven't provided a server-side API to support it, but you can get an idea of what's possible (see the Handling image uploads tutorial). Sometimes you want to include content within the page that shouldn't be editable - we call this static content. As an example I've included my Stack Overflow user flair on the right here. Whilst the static element can't be edited, the content around it can be. The editor supports unlimited undo/redo for the editing session. Either use the undo/redo tools in the toolbox or the standard keyboard short-cuts. 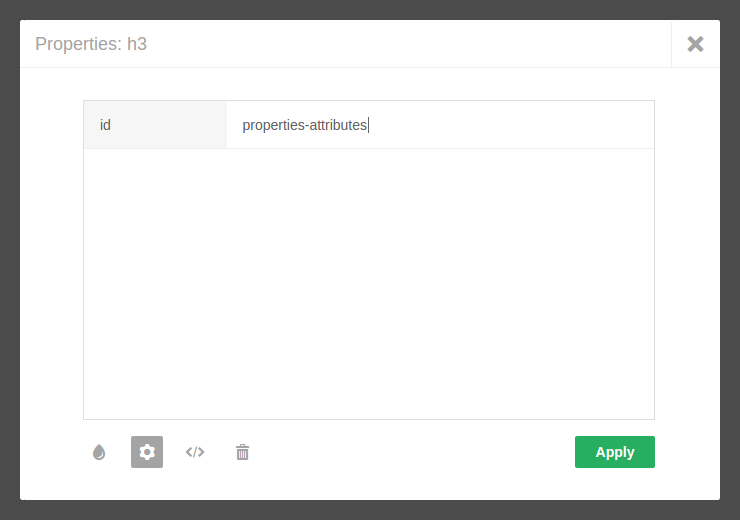 The properties of an element can be viewed and edited in the properties dialog. The dialog is launched when a tag in the inspector bar is clicked. The inspector bar may show a single tag, such as a p when a paragraph is selected, or multiple tags when the element is nested for example table > tbody > tr > td when a table cell is selected. Styles (CSS classes) can be applied to an element by selecting from a list presented in the properties dialog's style tab. In the demo only paragraph and table elements have styles to select from. 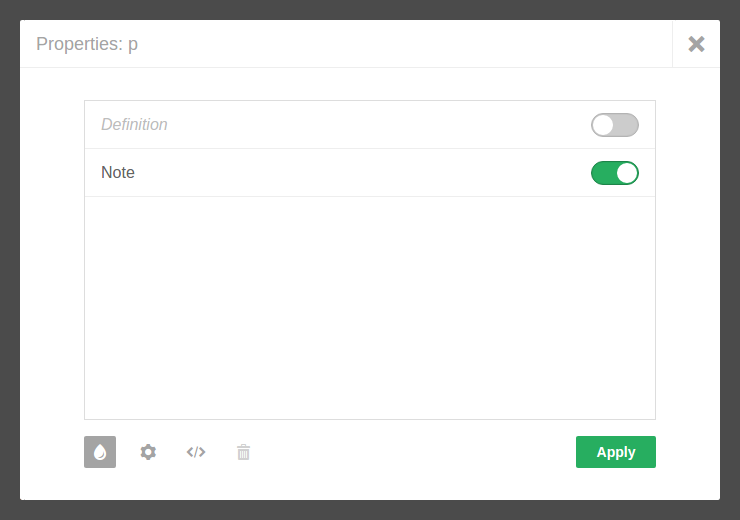 Only styles predefined for an element can be applied. The job of defining styles for elements is usually left to a frontend developer (see Configuring styles in the Getting started guide). Sometimes you need to add an attribute to an element, for example if you want to link to a section of your page you can add an Id to target in a link. You can add any number of attributes by specifying a list of name value pairs (specifying a value is optional) in the attributes tab. Another common case is the allowfullscreen attribute which can be added to the iframe of an embedded YouTube/Vimeo video to allow users to play the video full-screen. If you absolutely need to change the content of an element at the HTML level, that's possible too. The last tab in the properties dialog allows you to view the inner HTML code of the selected element and update it directly. Flexible The ContentTools package is made up of 5 libraries, each or which can be used independently (see the API for details). Extensible The package is designed to be easy to extend (see the Adding new tools tutorial). Small The full editor (JS, CSS, Images, and icon font) is 241kb (49kb gzipped).